This is the third in a series of posts about how to get started with brewing your own beer. [PART 1] [PART2] At this point in your homebrewing adventure, you’ve already gone through a series of steps: your malt extract was reconstituted in water, boiled, you added hops, yeast was pitched to the cooled wort, and the mixture was fermented for a week or so. Northern Brewer’s Breakfast Stout, the beer we’ve been talking about, is a relatively simple beer to brew: no secondary fermentation is required. As many home brewers with simple setups don’t use filtration, secondary fermentation (transferring your beer to another carboy and keeping it there for another 1-3 weeks) is often used as an intermediate step between primary fermentation and bottling. Although it doesn’t replace filtration, secondary fermentation does have a number of benefits. It allows the flavor to mature, protein and spent yeast to precipitate, and generally allows the beer to clarify (among other things). Since we’re not really worrying about that in this recipe, we can move right into bottling. Bottling is the final thing you need to do before you can drink your beer, and is the most labor intensive part of brewing. If you’re like me, you get your stock of 12 ounce bottles from beer you (or your friends) have drank. Each one of those bottles needs to be cleaned and de-labeled before the day you are ready to bottle. This is an easy (but time consuming) thing to do – just soak your bottles in a sink of warm water overnight and scrape the labels off with the dull end of a butter knife. You’ll eventually appreciate beers that have easy to remove labels, like Sam Adams or Magic Hat (if you’re in the Northeast). It never hurts to drink an extra few beers, you know, to have the empties on hand. Once you’ve cleaned and removed the labels from your bottles, you’re ready to start. At this stage, your wort has been fermented and is now beer, which means that it will be sensitive to air exposure. During the process of bottling, you’ll want to minimize air exposure to prevent oxidation and the generation of off flavors, as I talked about a little bit in my previous post. This is in contrast to the earlier stages: when you splash your wort, it’s critical to get oxygen mixed into the wort to initiate fermentation. Now, air can negatively affect your beer. Another theme that’s critical here is sanitation. In addition to air exposure, any time you rack or bottle your beer you risk contamination. You should take sanitization extremely seriously as always, and ensure that every surface the beer touches has been cleaned and sanitized in order to minimize that risk. To begin the process, dissolve your priming sugar in a few cups of warm water. Priming sugar is a critical ingredient, as it restarts the fermentation process, allowing the yeast to produce that last little bit of CO2 that will carbonate your beer. The priming sugar is usually about ¾ of a cup of corn sugar that is similar to confectioner’s sugar in consistency. Don’t actually use confectioner’s sugar though – it often contains a small percentage of corn starch. If you’re in a pinch, you can use regular table sugar, as this is just sucrose. Once the priming sugar is dissolved, pour it into your sanitized bottling bucket. Now you can use the siphon that came with your equipment kit to rack your beer into the bottling bucket. Take care to let the beer slide down the side of the bottling bucket rather than splash into the center of the bucket, as this will minimize air exposure. Also make sure you don’t put the siphon all the way to the bottom of your primary fermenter: there should now be a 1-2 inch thick layer of spent yeast and other solid material on the bottom, and part of the racking process is to get rid of this yeast/hop residue. You should be able to see that your beer is clear during the racking process, as a cloudy beer is sometimes indicative of an incomplete fermentation (something you can measure directly by looking at specific gravity at this point as well). Once you’ve racked your beer into the bottling bucket with the priming sugar, put the beer into the sanitized bottles using the spigot at the bottom of the bucket and the bottling tip also included with your equipment kit. The bottling tip will allow you to fill all 50 or so bottles by only allowing the beer to flow out of the spigot when the tip is touching the bottom of one of the bottles. Cap the bottles using your capper (such as this Red Baron Capper – with video!) and sanitized caps, and you’re ready to go. You’ll inevitably have one partial bottle at the end, and it’s a great idea to taste it. This will give you a fantastic idea of what sorts of flavors to expect, and you’ll see how the carbonation affects the flavor of your beer as well as how the flavor has changed since it was wort. Put the bottles in a dark place that’s temperature controlled for three weeks or so and your beer will be ready to drink. During those three weeks, the yeast will eat the priming sugar and produce carbon dioxide. With no airlock your bottles are a closed system, meaning the CO2 can’t evaporate and will be dissolved in the beer, resulting in carbonation. The carbonation lowers the pH, tempers the sweetness of the beer, gives you the visually appealing foamy head, allows aromas to escape when drinking, and gives you the pleasant “fizziness” on your tongue when you drink it. When you bottle carbonate (as described here), you will have a layer of yeast on the bottom of the bottle. Make sure to not drink your homebrew directly from the bottle, as the last few swigs will be ruined by the yeasty flavor. Pour it into a clear pint glass or mug so you can get the best experience — both flavor and visual. So that’s all there is to it, in about a month you can go from a gooey, syrupy mess of malt extract and hops to a delicious home brew, with only a couple days of work. A typical five gallon Homebrewing is a blast, and it’s even more fun to do with a friend. Get out there and try it! 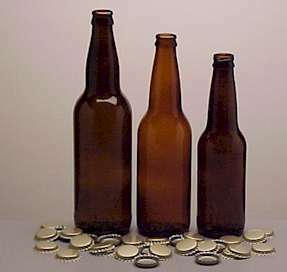 Posted in Homebrewing.Tagged Bottling, Carbonation, Homebrewing.